mikahaziq: Halal Food Singapore : Abu Mubarak Nasi Mandi Review - I am the only one differing? 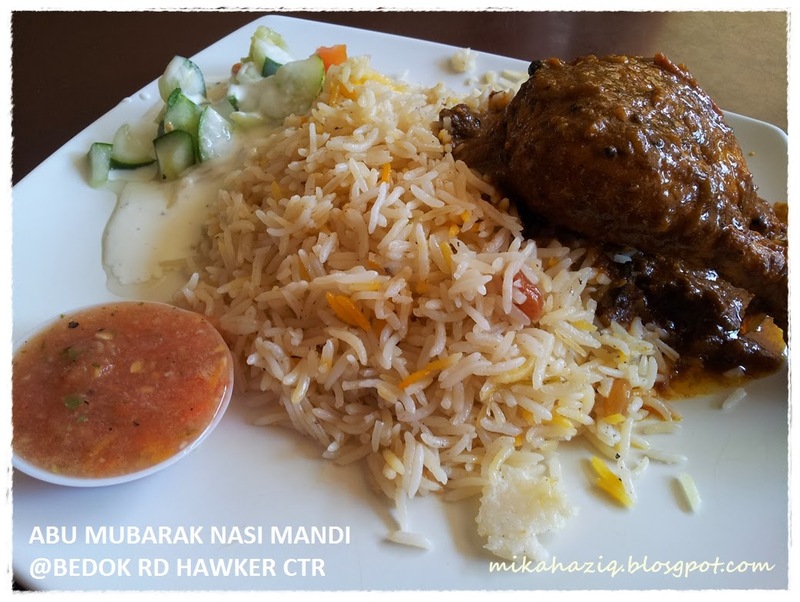 Halal Food Singapore : Abu Mubarak Nasi Mandi Review - I am the only one differing? Ok, so I saw a few friends posted pictures of Abu Mubarak Mandi Rice on fb and commenting yum yum and such that I felt really compelled to try it. Especially since the stall is at Bedok Road Hawker Ctr which is where hubby and I love to head to whenever we crave for Nasi Rawan. I have to say that my expectation was quite high since it's so famous and I finally had the chance to try it yesterday on our super short one night return to Singapore. The stall's signboard shows pictures of falafel, hummus, foul and khabsah rice, I was getting pretty excited but one thing bothers me.. the lack of queue.. I mean if its so famous why is there no queue? *typical Singaporean mentality* and when I came near the stall and enquired about other dishes, they said only Mandi Rice is available *bummer* I really would like some falafel as well. I was contemplating whether to order chicken or lamb but I saw 2 person eating lamb mandi near the stall and the lamb looked like it's drenched in bryani gravy (which is not how mandi lamb is usually cooked as per what I am accustomed to, but I could be wrong) so I decided to go with the chicken. Unfortunately, it's the same thing with the chicken:( I am used to chicken mandi that is grilled, tender white meat with slightly crispy top, a simple chicken that complements the mild taste of the rice and not overpower it instead. The tomato salsa was also a tad on the spicy side (I think I detect birds eyes chilies) with too little tomatoes, I am used to a salsa that has more tomatoes and just a hint of chili. I also like my mandi rice to come with a clear soup, which in this case is not available. The cucumber yoghurt salad was runny since we all know that cucumber tends to get watery after a bit, it kind of make the yoghurt very diluted and bland, maybe a thicker yoghurt and some black pepper and salt would help a bit. I do find the mandi rice taste very spot on and delicious, so if the chicken is grilled properly instead and the salsa and salad improved, I would have really enjoyed the dish. If you have never eaten mandi rice before, Abu Mubarak Nasi Mandi will really please you but if you eat Mandi Rice frequently (like me who is spoilt for choice in KL and who also have very vivid and fond memories of Mandi Rice in Egypt and Karama Dubai) you might want to lower your expectations a notch or two.